What a perfect ring to give to him or her. 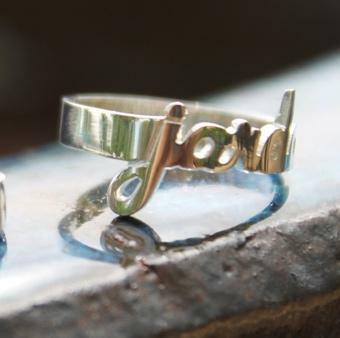 Our mini name rings are made from sterling silver. Choose to stack these with a diamond band or wear alone. 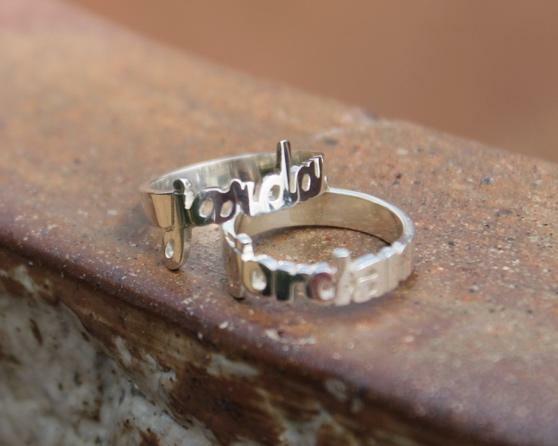 Perfect gift for a younger girl for her first ring. Maybe order several and stack them with your children's names. Choose from either our script font or our block font. Names are all lower case letters. We can do as many as 8 characters per name. Size is about 1/4" for letters depending on the font chosen. You may upgrade to gold plated over sterling silver or rose gold plated over sterling silver. Ring sizes are whole sizes only. Price: $59.00 In stock! - Browse this brandOur products are custom made to your specifications. This product ships up to 3 weeks after your order is placed.